"I was served this cookie at a restaurant in Springfield, MO during a business conference. Went home and made up this recipe which has been a hit at any church gathering when I take them...better than the one I had at the conference." In a large bowl, cream together the butter, brown sugar, and white sugar until smooth. Beat in the eggs, one at a time, then stir in the vanilla and almond extracts. Combine the flour, baking soda, and salt; gradually stir into the creamed mixture. 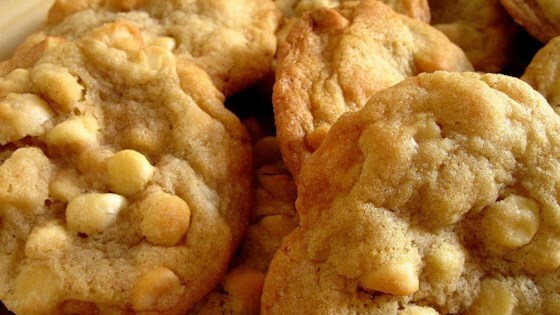 Mix in the macadamia nuts and white chocolate. Drop dough by teaspoonfuls onto ungreased cookie sheets. Some of the best cookies ever! I made them into bars, and way undercooked them so they would be soft, and a little chewy. I've been searching for this recipe for years - Got it!!! I made this recipe without the almond extract (doubled the vanilla) and they were delicious. I found these cookies to be quite sweet with the amount of sugar called for and wouldn't add any more.